There is a unique, or at least I think it’s unique, cluster of apparently family burial plots in Conception Bay South. I believe each of these five burial plots contain multiple burials and most of them have grave marker stones. Some of the stones have text and other small stones are erected upright in the soil. I’ll start by telling you about the first one that was recognized archaeologically. 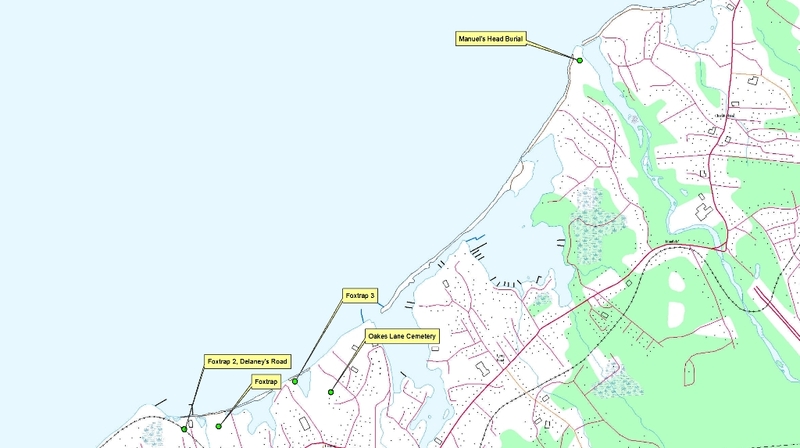 Five family plot burials known in the Manuels-Foxtrap area. In April 1986 the Royal Newfoundland Constabulary (RNC) were called to investigate the discovery of human remains at a site we call Foxtrap. The remains were found as a result of construction activities. Once the RNC determined that he remains were not related to a criminal case the matter was handed over to the forensic anthropologist working in the province at the time. According to the report from the forensic anthropologist the recovered remains were those of an adult female and child, buried in a coffin. The female was estimated to be 18-20 years old based on the x-rays of the long bones in which the epiphyses are nearly fused to the shafts. An age estimate for the child based on tooth eruption in the recovered maxilla indicated an age between 2 and 6 years old, probably around 4 years old at time of death. An archaeologist examined the recovered coffin nails which were hand-forged. This technique for making nails ended in much of North America by the late 18th century and they were replaced by cut nails. However, in Newfoundland hand-forging nails continued until at least the 1920s. Based on this it is suspected the burials predates 1900. Also in 1986, just down the road from the Foxtrap site, archaeologists were alerted to another burial on private property. This burial, Foxtrap 2, was not excavated by archaeologists, which is standard practice today unless the burial is threatened and in this case the land owner agreed not to develop the land. The archaeologists believe they saw between six and eight broken slate headstones. While they were walking over the land they noted undulations and suspect there could be 20-30 burials in the area. The sister of the land owner (an elderly woman) told the archaeologists that there were no burials on the land in her father’s or grandfather’s time, so the existing burials likely predate the mid-19th century. In 2007 I had the opportunity to revisit the Foxtrap 2 site with the permission of the land owners. The burials are located on a man-made ‘island’ of original land – all the land around them has been cleared using a tractor leaving the burials completely isolated. The ‘island’ is ~11m x 14m in size. Man-made island that contains the burials. It is possible the stone once read: “Sacred to the Memory of” and then contained the name of the deceased and the date they died. 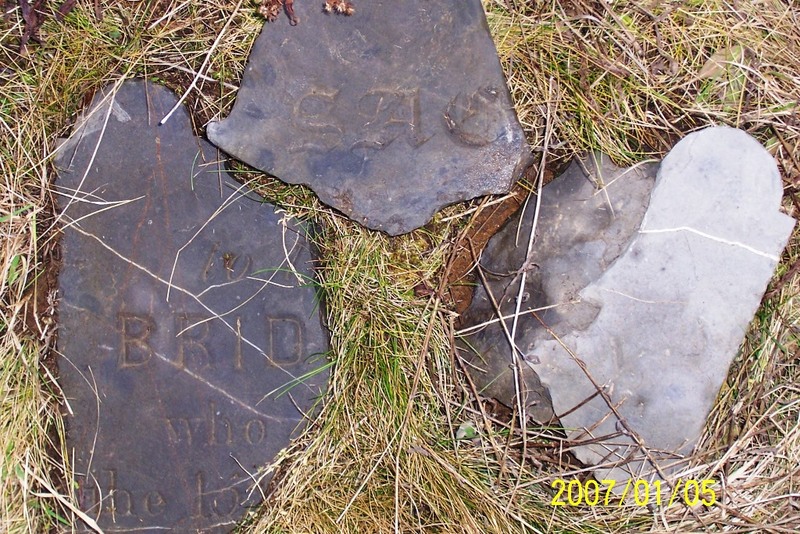 Photo showing partial headstone with the letters ‘SAC’ another piece with the possible name and date of death. Grave stone markers at Foxtrap 2. Also found at the site were several (5-10) small vertical slate slabs protruding from the ground. Based on my experience with other burials it is very likely these stones also mark graves. It is not clear if they mark both the head & foot of a grave or just the head. 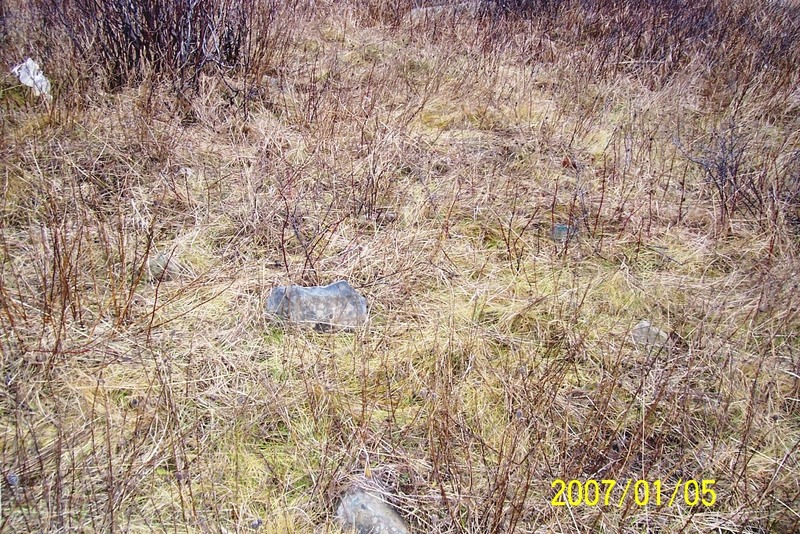 Given this uncertainty, as well as the presence of other stones that may mark graves, and the undulating surface of the area, it is difficult to arrive at an exact number of burials at the site. Just over one kilometre to the east of Foxtrap 2 is another family burial plot. This site is located in a small area of shrubs and undisturbed soil between two businesses just off Oakes Lane, hence the site name Oakes Lane Cemetery. The site contains up to half a dozen visible stone grave markers. According to genealogy research, there are believed to be at least four graves on the site which may belong to Richard Ridout (early spelling of Rideout) and possibly his first wife Rachel (nee Porter) or his second wife Elizabeth (nee Hiscock) and their children. The Rideouts once owned the property on which the cemetery is located. Richard was born in England in the late 1700s and came to Foxtrap around 1814 and married Rachel on September 28, 1814. He was known to be a community leader and according to family folklore, carried out church services, baptisms and funerals. He died in 1834. Rachel died between 1820 and 1824 and Elizabeth after that time. 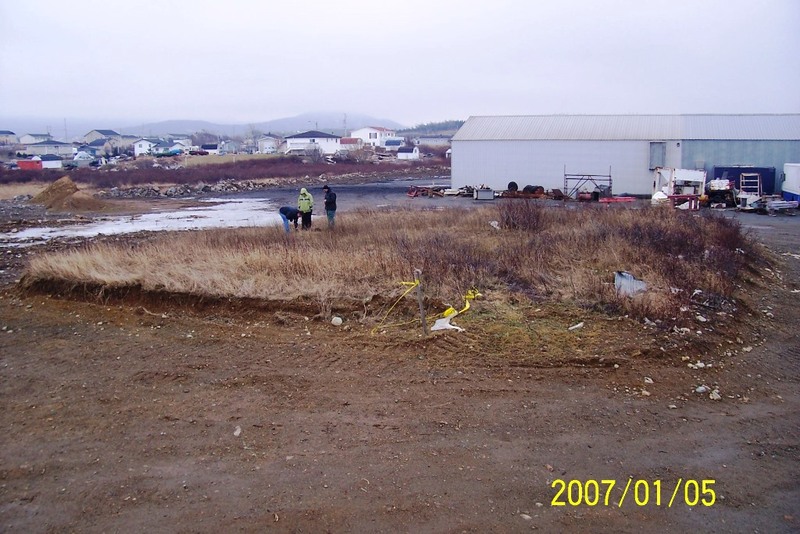 If this information is correct these may be the oldest known burials in Conception Bay South. In 2010 I had an opportunity to visit the site and photograph the headstones. Like most of these small family plots the stones grave markers are small erect pieces of slate with no text visible on them. Oakes Lane Cemetery grave stones. A few years ago I was contacted by a member of the Newfoundland’s Grand Banks website about another burial in a potato field just ~200 metres to the west of the Oakes Lane Cemetery. I have not had an opportunity to see this burial yet. So it seems the small cluster of sites that I saw was not all that unique, rather the fact that they are recognized archaeologically is what is unique. 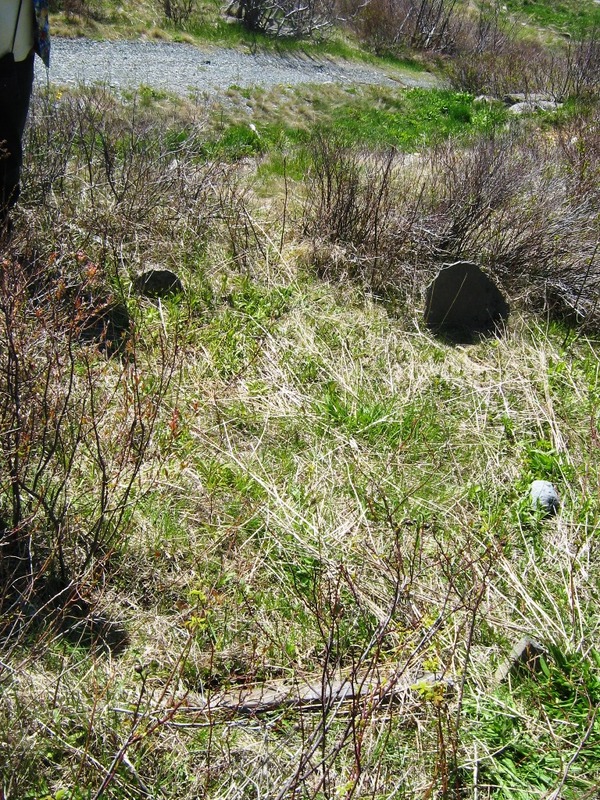 I am not sure if this pattern of small family burial plots only occurs on the Avalon Peninsula or is a common occurrence throughout Newfoundland and Labrador. If I had to guess, I would say it was a common occurrence until a church was established nearby. 1989 Skeletal Material Retrieved from Foxtrap. Archaeology in Newfoundland and Labrador, 1986, Annual Report No. 7. Edited by J. Callum Thomson and Jane-Sproull Thomson. Historic Resources Division, Government of Newfoundland and Labrador, pp 290-291. 2011 Manuels Head Burial Site (CjAf-01) Desk-based Archaeological Assessment. 1975 The place of burial: spatial focus of contact of the living with the dead in eastern areas of the Avalon Peninsula of Newfoundland. MA thesis, MUN. Very interesting and great work & dedication. Thanks, that’s interesting to note. As far as I know the skull is still in Ontario and site was not formally marked.